There are several different configurations of small hydropower installations. Examples of the most common types of configurations are described below. The majority of existing hydropower capacity in Wyoming are dam installations owned and operated by the U.S. Department of the Interior, Bureau of Reclamation. Dams in Wyoming were primarily constructed for multiple uses, including water supply, flood control, hydropower, and recreation. Hydropower facilities at Reclamation dams are typically large scale; however, there are potential applications at unpowered dams for small hydropower. Depending on the type of dam and outlet configuration, several alternatives are available for hydropower development. 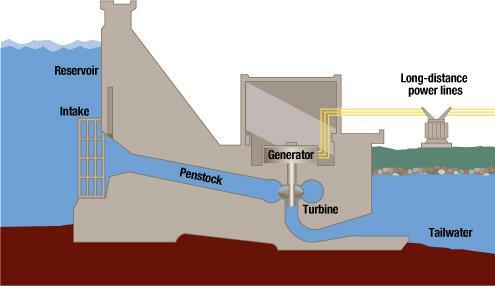 A general schematic of hydropower on a dam is shown below in Figure 3. Although slightly larger than the five MW small hydropower limit, the Guernsey Powerplant at the Guernsey Dam is owned and operated by Reclamation. 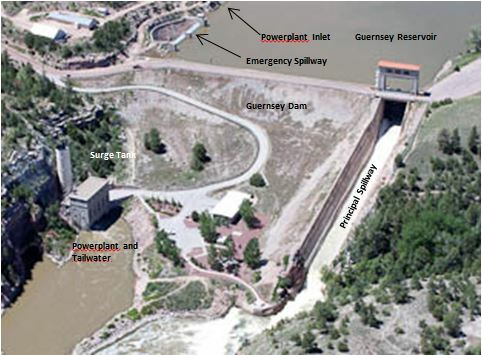 The Guernsey Dam controls North Platte River flows for varying irrigation demands. The original powerplant was constructed in 1928 and updated in 1994 and consists of two Francis turbines with 3,200 kilowatt (kW) generators each for a combined capacity of 6,400 kW. The turbines utilize 70 feet of head and 700 cfs each. The project was constructed on a secondary outlet from the reservoir, and the powerhouse is at the toe of the dam along the right abutment. The primary outlet works is a concrete chute along the left side of the embankment. An alternative to using an outlet through the dam is to use a siphon penstock over the dam. Siphons may be preferred if the existing outlet works are not suitable for hydropower. There is a limit to the height of the siphon above the reservoir level that would need to be considered in the design. 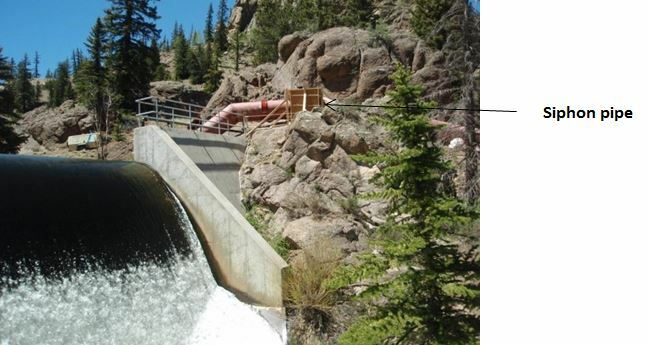 There are no examples of a siphon penstock in Wyoming; however, The Colorado Energy Office describes the Humphreys Hydroelectric project near Creede, Colorado, in The Small Hydropower Handbook. The Humphreys Hydroelectric project was constructed by a private landowner and consists of one 310 kW Cross Flow turbine using 91 feet of head and 60 cfs of flow.